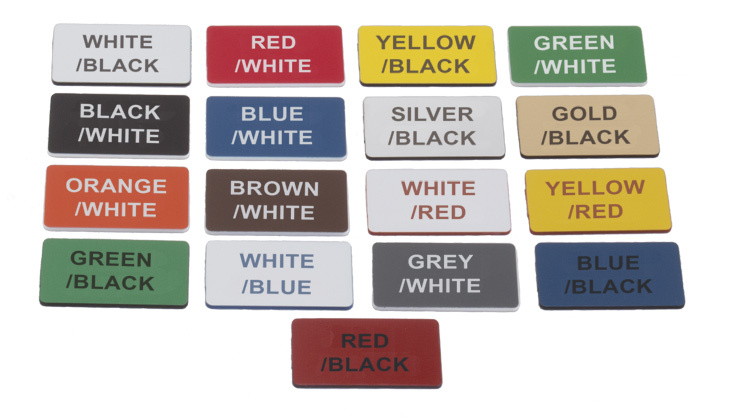 Engraved plastic signs can be used in all sorts of technical installations and plants. The signs are made from laminated acrylic that is 1.6 mm thick. The second layer is shown after the engraving is done. All colours, except gold and silver, are UV stable and can be used outdoors. Gold and silver can also be used outdoors but the colour will fade with time, however, the text will remain fully readable! 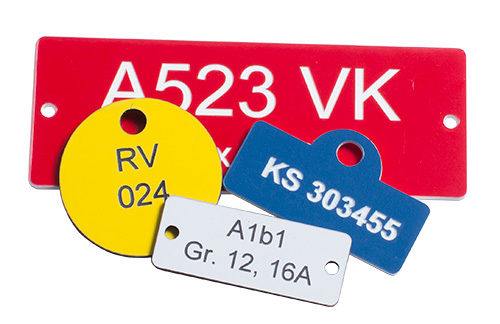 The signs are delivered on plates in the same order that they were created which speeds up installation and keeps you from wasting time having to search through a mixed box of labels. The adhesive tape on the back of the signs can be used to install it on plain surfaces but it is mainly for support while installing the sign with screws. Order plastic signs in SignStudio. There you can choose colour, shape, holes, fonts and much more. You can type in the text yourself and have full control over the content and spelling. What you type goes directly to the machines, please remember to check all spellings. Plastic signs are dispatched from us within 24 hours. Accessories like screws, bits and ball-chains can be ordered at the same time so that everything is in the same package when it is time for installation.